Associated with the making of steel on Teesside is the construction of bridges, one of the industries for which the area has achieved international recognition. Chief among the bridge building firms was Dorman Long, a firm which began as an iron and steel works in 1875 manufacturing bars and angles for ships. A natural progression from this was to become involved in the construction of bridges particularly when Dorman Long took over the concerns of Bell Brothers and Bolckow and Vaughan in the late 1920s. 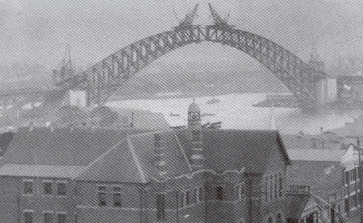 The most famous bridge ever constructed on Teesside was Dorman Long's Sydney Harbour Bridge of 1932. This was partly modelled on the 1929 Tyne Bridge, a construction regarded as the symbol of Tyneside's Geordie pride, but also a product of Dorman Long's Teesside workmanship. The great example of Dorman Long's work on Teesside itself is of course the single span Newport Lifting Bridge. Opened by the Duke of York in February 1934 it was England's first vertical lifting bridge. With a lifting span of 270 feet and 66 feet in length it is constructed from 8000 tons of Teesside steel and 28,000 tons of concrete with towers 170 feet high. The electrically operated lifting mechanism allowed the road to be lifted 100 feet in one and a half minutes by means of ropes passing through sheaves in the four corner towers. In time, Middlesbrough's reputation for innovation and manufacturing supported the growth of other industries such as shipbuilding, offshore fabrication and chemical production. These have contributed in no small measure to Britain's prosperity.